In partnership with TEG Dainty, WWE will return to Australia with WWE Super Show-Down, a historic event taking place at the Melbourne Cricket Ground (MCG) on October 6, featuring the largest roster of WWE Superstars and Legends ever to appear in the country. Tickets for WWE Super Show-Down will go on sale June 28 at 10 a.m. AEST via ticketek.com.au. An exclusive Telstra Thanks pre-sale for customers starts this June 22 at 12 p.m. AEST and is open until June 26 at 10 p.m. AEST. Further ticket information is available at tegdainty.com. The event will stream live on WWE Network and be available on pay-per-view around the world. 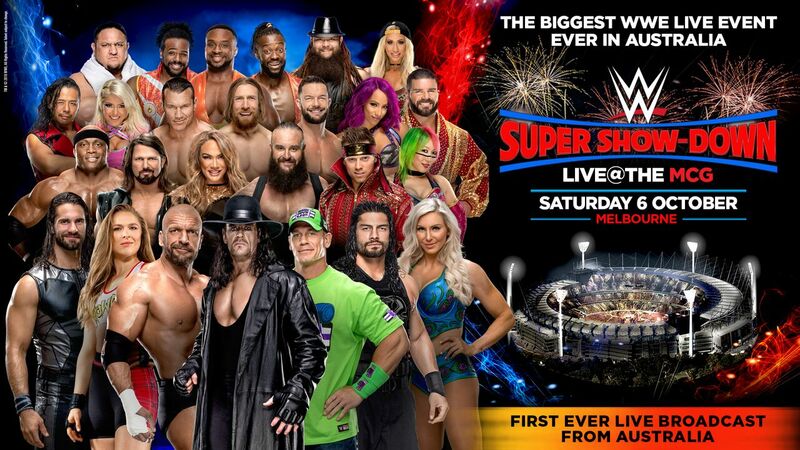 "WWE Super Show-Down will be one of the biggest sports and entertainment events of the decade," Paul Dainty, President & CEO of TEG Dainty, said. "After the historic Global Warning event in 2002, TEG Dainty is excited to be making history once again with WWE. Australia has always been a special place for WWE and our fans are among the most enthusiastic on the globe. This once-in-a-lifetime spectacular will showcase Australia to a global audience of millions in one of the world's most iconic sports stadiums." "WWE Super Show-Down will be an epic event," Vince McMahon, WWE Chairman & CEO, said. "Our partnership with Paul Dainty reflects our ongoing commitment to the market and provides an opportunity to deliver an event of this magnitude." "The eyes of the world will be on the Melbourne Cricket Ground in October when thousands of visitors from across Australia and the world descend on our great city for WWE Super Show-Down," Victorian Minister for Tourism & Major Events, John Eren, said. "The Victorian Government will keep bringing the biggest events to our state because these events are good for our economy, good for our tourism industry and good for local jobs." The largest WWE event previously held in Australia was the Global Warning event in 2002 at Melbourne's Etihad Stadium, setting an entertainment attendance record of 56,743. Additional Tour Information can be found at tegdainty.com.